Scuba diving is perhaps the best way to explore the fantastic underwater world, getting up close with the wonders and the secrets of this marine universe, with its breathtakingly colourful and diverse inhabitants. Floating below the azure waters, you are in an ethereal – sometimes hostile – environment, with a limited supply of air on your back and with only your fellow divers as your lifelines. Over the years and the decades, scuba diving has evolved into a non-competitive but a very exciting adventure sport. SCUBA is the short form of ‘Self Contained Underwater Breathing Apparatus’. It was developed in the mid-1940s by the world famous underwater explorer and conservationist, Jacques-Yves Cousteau (with more than a little help from Émile Gagnan), for the French Navy during the Second World War. After the war, however, diving turned into a recreational sport, which has since been taken up by millions worldwide. People living by the coast have been diving for as long as humankind has existed – and for as long as man has been able to swim. In the Arab world, there were pearl divers, men who made a living looking for pearls underwater. Of course, coastal folk around the globe also dived for food, their very lives depending on their diving skills. The history of modern scuba diving can be traced to warfare, and much of the advancements in diving and diving techniques arose from the needs of navies, who’d constantly have to go on rescue operations. Over the centuries and over the years, diving equipment has become more and more sophisticated and hi-tech, though the peculiar dangers associated with diving still remain. It was, however, the contributions of the French pair of Cousteau and Gagnan that helped take scuba diving into the modern world, made it accessible and, in turn, hugely popular with the masses, with the invention of the demand regulator (see equipment). As scuba diving’s popularity grew, so did the need for a safety code and regulations, and organizations that specialized in instructing and certifying divers. This led to the formation of the National Association of Underwater Instructors, in 1961, and the Professional Association of Diving Instructors, in 1966. India offers unlimited possibilities for scuba-diving enthusiasts. Its extensive coastline is dotted with sandy beaches; its two major groups of islands – boasting some of the most unexplored and exotic diving locations in the world – are enough to whet the appetite of the most demanding diving buff. The Andamans and Lakshadweep offer a quality of scuba diving unmatched in the world, and both now figure prominently in the itinerary of a fair number of domestic as well as foreign tourists. The biodiversity of these groups of islands, alongside their relatively warm waters, make scuba diving in India a very attractive adventure option. The (relatively) affordable prices are another draw for foreign travellers. And the pristine locations more than make up for what the country might lack in terms of diving infrastructure and state-of-the-art equipment. The coral in the waters around the Lakshadweep Islands is shaped like a ring and encircles a staggeringly beautiful emerald-blue lagoon. In 1998, most of the corals died due to the El Nino effect (global warming). But, of late, thanks to the water temperature being around 28C-30C, the corals have gradually been able to revive. Almost all islands here offer scuba diving, and besides Lakshadweep Tourism, there are a couple of private operators offering excellent facilities for diving. Meanwhile, the Andaman and Nicobar Islands – 362 of them, scattered in the Bay of Bengal – are a paradise for both the diver and the non-diver. These volcanic-tropical islands offer a biodiversity that one rarely comes across in a single place. Unchartered waters, exotic underwater terrain, steep wall dives and exciting drift dives are what make the Andamans one of Asia’s most sought-after diving destinations. Goa is still uncharted when it comes to scuba diving. Underwater visibility is limited (between 6m and 12m), while marine life (and the coral) is not as exhilaratingly varied as in the Andamans and Lakshadweep. But over 1000 shipwrecks are believed to dot the Goan coast, makes diving in these waters a thrilling experience (and something akin to a treasure hunt for the historically minded). And Goa does provide tourists an opportunity to acquire internationally recognized dive certification, at a relatively low cost; it also has two PADI dive schools of international standard, operating off Panjim and Bogmalo beaches. Netrani Island (or Pigeon Island), off Mangalore, is virgin territory but it does (apparently) offer some superb diving, in stunningly clear-blue waters with an abundant variety of marine life and coral reef formations. In fact, conditions off the coast of Karnataka are almost perfect for scuba diving – this could be India’s next scuba-diving destination. 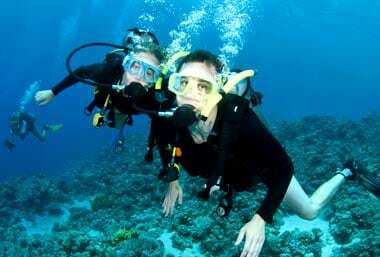 Know more about popular options for Scuba Diving in India. From autumn, through the winter months, and into spring, is when you can encounter the best conditions for scuba diving (October/November to April/May). In the Andamans, peak season is between December and February. India boasts two main scuba-diving sites in the Andaman and Nicobar Islands, off the east coast (closer, incidentally, to the Asian mainland than the Indian Subcontinent) and the Lakshadweep Islands, off the western (Kerala) coast. Both offer stunning coral reefs, top facilities and a fantastic diving experience. Tips1. If you are not sure whether scuba diving is the right adventure activity for you, try a spot of snorkelling first to become familiar with the marine life and the corals. While snorkelling, you are not totally underwater; you stay afloat on the surface but, with the help of a face mask and a simple breathing apparatus, you can enjoy the underwater world. 2. One should be able to swim 200 metres continuously, and tread water for 10 minutes, to receive Open Water Certification (and higher certification). 3. The major certification agencies are PADI (Professional Association of Diving Instructors), BSAC (British Sub-Aqua Club), NAUI (National Association of Underwater Instructors), SSI (Scuba Schools International) and CMAS (French Diving Federation). PADI is by far the largest international organisation teaching recreational scuba diving; it has, till date, certified over 12 million divers worldwide. 4. Scuba diving is, comparatively, an expensive adventure option. In most countries, it can cost anywhere between US$200 and US$800 per dive. 5. Do not think of diving alone. 1. There are a few good international-level scuba-diving operators in the country; do thoroughly check the credentials of the operator, whether the instructors are PADI (or equivalent) certified and whether the equipment available is of good quality. 2. A reasonable command of English is helpful as the courses involve a basic understanding of physics, physiology, environment, etc. 3. The minimum age for diving is 10 years – there is no upper limit (for some dives, the minimum age is 14 years). 4. You should aim at acquiring the minimum certification of ‘one star’, which takes about 4-5 days and costs between Rs. 13,000 and Rs. 15,000. Thereafter, you can rent dive equipment and accessories from any recognized dive operator at around Rs. 1200 per dive. 5. Even though it might be a little expensive, go with the best. Scuba diving requires a reasonable degree of physical fitness. In India, anyone wanting to try their hand at the sport must take along a medical certificate stating that they are medically fit, and that they have no history of asthma. 1. Do not touch, or walk on, living coral – it will die. 2. While wearing fins, try as much as possible to keep your feet away from the reefs; a kick from your flipper will likely result in an abrupt spill of water, which is enough to permanently damage the coral. 3. While diving, try and control your descent; a hard landing on the corals can destroy them. 4. The coral is a living organism – do not break pieces of it from a reef. Picking up corals is strictly prohibited and is punishable with heavy fines. Do bear in mind that it is also illegal to export dead coral – even if it is just fragments of coral lying around on a beach.